"...that support the gastrointestinal, biliary and digestive tracts. *"
First, the gastrointestinal and biliary tract is the digestive tract. So that claim is redundant and stupid and dumb. Second, we only have one digestive tract, so "digestive tracts" is misleading. The asterisk in the above claim refers us to this fine print located on another box panel two (of six). But don't listen to that. This tea can be used to diagnose many important diseases, none of which we have time to go into here. "Peppermint leaf, sweet fennel seed, ginger rhizome and cinnamon bark have been used throughout the ages by many cultures and in many culinary traditions to assist with digestion. *"
I thought Ginger Rhizome was that girl who married that old sugar daddy, spent all his money, and then sued his children for calling her a country tart. No matter. So why does this sentence need an asterisk? Apparently, it refers us to the same fine print as the previous asterisk. But why do I care if the FDA has evaluated this statement? Instead, it should say that the British Society for Tea History has not evaluated this statement. Damn BSTH, always slow to act. "Eater's digest is a flavorful complement to any meal and a satisfying way to end one." I disagree. This is the worst tea I've tasted since the time I once bought some eucalyptus leaf tea. Thus, it was not a flavorful complement to anything, and neither was it a satisfying way to end one. Furthermore, I feel that the first line at the top, "...ensuring that the beneficial components of the herbs remain intact" should be changed to "...allegedly beneficial components." For Christ's sake, they just admit the product is not intended to diagnose, treat, cure or prevent any disease. Then what the hell are the benefits? That it puts you in a good mood? Ha! This claim is confusing. 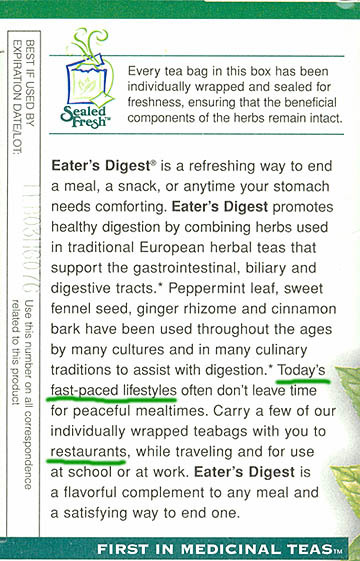 Are they saying that they are the leader in medicinal teas or that they are the first company to ever produce medicinal teas? I think they should be more clear about this as it would make a big difference to me as a consumer deciding whether or not to purchase this tea.